How hot does your car get in summer? 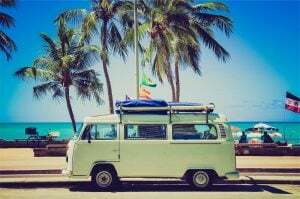 Home › Advice › How hot does your car get in summer? 85 degrees Celsius is enough to burn your skin, and that’s how hot black surfaces in your car can reach if they are exposed to the sun when it’s just 35 degrees outside. The air temperature inside the car could be 65 degrees – enough to kill a child or a pet. Granted, we don’t get to 35 degrees often (Napier and Ashburton, I’m thinking of you), but the temperature rises are as extreme even at 25 degrees. Every year in New Zealand people leave pets or children in hot cars or in the sun on a hot ute tray. Sometimes it’s while they quickly go to do something like buy a coffee; other times it’s for a prolonged period. Occasionally a child or pet suffers brain damage due to the heat. Or it dies. In sunny weather the temperature inside the car can be double that outside. Even within just 10 minutes in 24-degree weather the inside of a car can reach 38C. Within half an hour it will be 50C. Pets can’t pant fast enough to lose heat quickly enough in these temperatures. Their core temperature increases and once it goes above 41.5C enzymes are destroyed in their cells and eventually they die. You should never leave children or pets in the car in hot weather. Ever. Even if you park in the shade. Take them with you. Here are some tips to help keep your car or truck interior cooler. Park in the shade – it’s direct sunlight which is the biggest factor in heating your car as the dark surfaces absorb the sun’s rays. Use a reflective sun shade in your windscreen – this will keep your dashboard, steering wheel and seats cooler, too. If you don’t have one, keep your sun visors down. If you have a convertible and you feel it’s safe to leave the roof down, do so. Leave your windows open slightly – an inch or two. It’s not good for security but it will keep a bit of air moving around the vehicle. Use a solar-powered window fan to draw outside air into the vehicle. When you get back to your vehicle, open all the doors to quickly get fresh, cooler air inside. Use the air conditioning to cool it down quickly. Bear in mind that air conditioning will increase your fuel consumption more than just having your windows down, though.